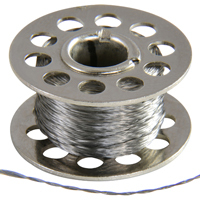 Stainless Steel, 2-Ply, 316L Conductive Thread is ideal for any wearable / e-textile application. Its strong and smooth construction is a little thicker than every day polyester or cotton thread, making it a little stiff with a waxed thread feel. However, it is still thin enough to be sewn by hand using medium-eye needles or with a sewing maching that can handle heavier threads. With a fairly low resistivity, it can be used to drive LEDs and other electronic components, making it the optimal conductive thread for any wearables work.